American football, one of the most popular sports in the US, evolved from the mixture of rugby and soccer back in the day. As a sport, American football is becoming ever-increasingly popular, and even though primarily played in the United States, it is slowly spreading to other continents as well. The most popular league of American football is the NFL which has bettors across the globe. In case you are one of them, stay tuned because, with this article, we will try to cover some of the markets and tips for the newcomers looking to start betting on NFL. Pinnacle in their sports NFL section offers a variety of markets which can be split into two categories, one consisting of the basic markets and one featuring alternative betting markets. The basic markets are split into three types such as the money line, handicap and totals. The money line is the most commonly used type of betting, especially amongst the newcomers. It is straightforward as you can only bet on the winner of the match. Handicap is more used by the advanced bettors. By giving one team a handicap, it allows for the teams to appear more balanced, which results in better betting odds. Depending on the handicap given, you may end up winning even if your team lost, as long as they didn’t lose by more than the handicap offered. Totals are often referred to as the Over/Under style of betting. Bookmakers will often provide an option of total points scored by both teams and bettors will have an opportunity to bet whether that number will be lower or higher. Some of the alternative methods of betting on NFL on Pinnacle involve placing bets, not on the outcome of a game, but on the result of a whole season. For example, you can bet on a team’s total wins. Pinnacle NFL section also offers specials which come in the form of betting on the winner of the Super Bowl or the winners of the NFC or AFC conference. One of the best things when it comes to betting on Pinnacle’s website is the fact that the betting procedure is the same regardless of the sport you are betting on. For starters, you would need a valid account on their website. Follow the simple procedure and register your account. Immediately after confirming your account and logging in, you will be taken to the betting section. All you have to do here is navigate to the category you are looking for, in this case, the NFL section. The following step involves setting up your account and deciding on the deposit and the withdrawal methods. Being one of the most established sportsbooks on the market, Pinnacle offers a variety of choices for that. All of the popular options are represented such as Visa, Master Card, and Maestro. Popular online payment methods like Skrill, Neteller and many more are included as well. After you have chosen on which game to bet, now simply choose your market and your odds and add the amount you are willing to bet. Before finalizing the bet, you will be taken to the confirmation page. This is only to ensure that you have made no accidental mistakes. After you confirm that everything is in order, you will be done with the whole procedure. Congrats – you’ve just placed your first bet on Pinnacle! There are few different aspects that everyone should cover when it comes to betting online. One of the most essential parts of betting on any sport is having a proper understanding of the sport or league you are betting on. The other two things that closely follow are the knowledge of the teams and the players and evaluating your odds to form a proper betting strategy. Even if you are an avid fan, there are always new things to consider when trying to place a successful bet. Best tip would be taking on a strategy that is best suited to your knowledge and experience. However, if you really are eager to learn and improve your chances, you can always read some of the fantastic articles and betting guides featured on Pinnacle’s website. Q: Is there a welcome bonus to bet on the sports section? A: No, currently there are no sports bonuses available at Pinnacle. Q: Can I watch the game streams? A: No, Pinnacle doesn’t offer support for watching the games through their website. Q: I have a problem, what should I do? A: Best way would be to contact the customer support at customerservice@pinnacle.com. 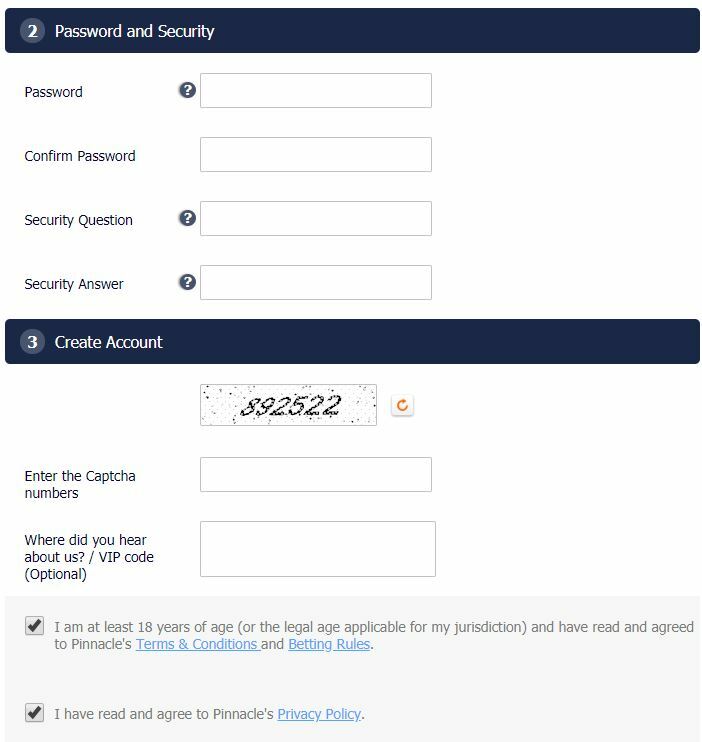 Make sure to add your Customer ID number to make the process smoother.